Welcome to Gingerbread Epcot. Or as I like to call it: Experimental Prototype Candy Of Tomorrow. 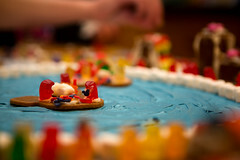 This year’s gingerbread project was a celebration of Spencer and Templar‘s trip to Disney World last January. 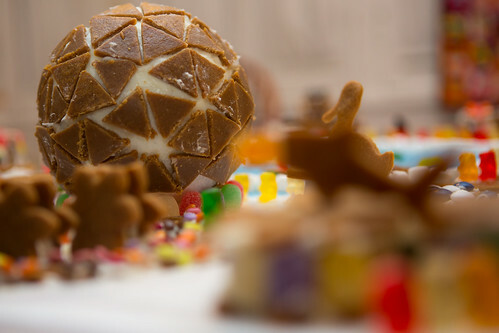 In anticipation of the trip, last year we considered the idea of building Spaceship Earth from Epcot but realized too late that the structural properties of gingerbread need quite a bit of help supporting itself in a geodesic formation. But with a year to think about ideas, we happened upon a plan. We obtained a foam crafting ball as deployed it as the central core of the iconic Epcot structure: Spaceship Earth. From there it was a matter of constructing a number of smaller structures to represent some of the various countries in the World Showcase around the big lagoon. We also added two other major Epcot attractions not associated with the World Showcase: Test Track and the octopus-shaped Living Seas aquarium. As always there are elements of gallows humor in this year’s exhibit. Several of the gummi Imagineers have caught fire on the firework floats within the lagoon– and somehow a great white shark is swimming freely after hapless prey floundering near the promenade. You know, another typical Christmas scene. The prominent duck terrorizing gummi patrons behind Spaceship Earth is not named Donald as one might expect. This is a returning appearance of Atomic Duck one of our first gingerbread scenes years ago.